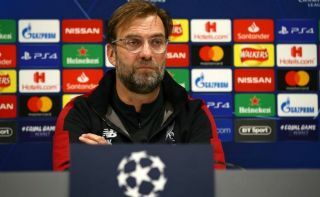 Liverpool manager Jurgen Klopp seems a little rattled ahead of his side’s big game against Bayern Munich in the Champions League tomorrow night. Speaking in a press conference ahead of tomorrow’s match, the German tactician did not react well to a question about whether or not his side should ditch the Champions League in order to focus on the Premier League title race. Liverpool do not have the same kind of squad as their rivals Manchester City, and could struggle to balance two high-intensity competitions between now and May. Sky Sports pundit Gary Neville has previously said he feels LFC should throw away the Champions League this season to focus on winning their first title in 29 years. However, when this was put to Klopp today, he was not at all happy at seeing a former Manchester United player now working in punditry dictating the media agenda in this way. Klopp asked about going out of CL to aid PL chances.